An Amazon pricing template to help make better business decisions. 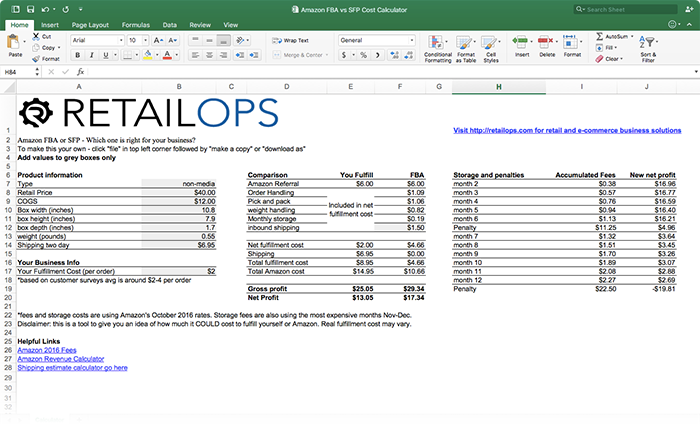 We put together a powerful excel template focused on helping Amazon sellers make the right business decisions at the right time. This template will help you decide whether Amazon’s FBA program or Amazon’s Seller Fulfilled Prime program is right for you. This excel template is a standalone tool that’s necessary for making educated selling business decisions on Amazon. This tool was built to work with our in-depth Amazon eBook (click here to download the free amazon eBook), unlike other resources this template just doesn’t cover Fulfilled By Amazon or SFP costs, but it also takes into account; shipping, storage, Amazon fees, box dimensions, weight, penalties, and even COGS to give you a full picture when making those critical business decisions. This is a must-have tool for any serious Amazon seller. Thank you! We are so grateful you put this together. We've been researching this topic for weeks and your article confirms all that we have concluded from our research. I’m Sam Moses, the co-founder and CEO of RetailOps and I’ve held key roles at eCommerce businesses including RedEnvelope, New Media Merchants, and DrJays.com. I intimately understand the difficulties that face multi-channel retailers. I lead the charge in building an in-house end-to-end solution as head of technology for a growing eCommerce retail business, annual revenue $500K in 2002 to $90MM+ in 2010. With nearly two decades in retail leadership roles, I have seen many things done right and many things done wrong in rapid growth retail businesses. After finding no answer to back-end systems in the marketplace for SME retail businesses, I built RetailOps in 2011 to fill the void. And now I want to pass that knowledge onto you.